We had an early start Friday morning on our grand adventure to Italy and France. The girls were super excited to board the plane and finally be our way. 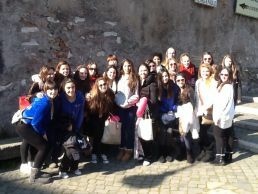 But, their excitment was soon overtaken by the lack of sleep due to packing the night before! After a 6 hour layover in Toronto we boarded our tranaltlantic flight to Munich and then on to Rome. 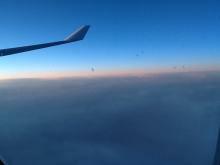 This is a photo of the sunrise over the Atlantic. 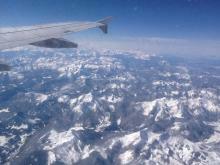 We had a beautiful view of the alps during our last flight. Our first stop in Rome was the Saint Sebastian Catacombs where we had a guided underground tour of this historical spot and we took our first group photo with about 10 different cameras. Tonight we are checking into our hotel, going for a group dinner and going to bed early. We need our beauty sleep for our busy day tomorrow.